"They give shelter. They are made of bricks. They are made of steel. They divide. But the thing is, they get build in people's heads." What a way of ending a short-film. A powerful, narrative-poetic style piece, which combines relevant stories with music. Walls spoke to us for its powerful message and visual storytelling. Of course, the title already puts you in the mood, but it's all about the way these stories are edited together, how they build their tension and how relatable these character become throughout the five minutes and a half of storytelling. A beautifully crafted short piece about a peculiar man and his fascination with bugs. Told through voice-overs on gorgeous shots of Steven Kuchter at his home, his story is told as much visually as it is with dialogue. You definitely have a strong feeling about who this person is and why he chose to do what he does. The nice twist at the end makes you feel like finding out about this character. This short doc explores trans women who have lived most of their lives trying to conform to a world that did not embrace them. Together, they are able to become strong, express who they are, and support each other in the roller-coaster of life. Solid, real, characters give depth to this sweet, profound, and thought-provoking piece. We hope this inspires you to always teach empathy. Another adventure in nature from German collective 3Hund. Underwater, on the sky, and anywhere they could possibly be, their objective with this piece was to create a surreal world based on simple geometric light shapes that seem misplaced, but somehow blend with their surroundings. A lucid dream, the effects were all done practically, as their first piece "Projections in the Forest." By placing bioluminescent light shapes and wires in untouched landscapes, the filmmakers tell a story of magic and loneliness, scored by their partner, Achim Treu. This specific video hit the spot when it decided to show what we call the future generation; a generation shaped entirely by globalization. What we love about this video is that it shows in a beautiful manner our meable identities, and how different cultures can shape and mold us into who we want to be. This short documentary is not only powerful but innovative in its form, it moved us and left us speechless. What we love about it, is Schnack’s inventive style and approach to such a serious topic, by deciding to keep it undecorated and unsophisticated, stripping it down to it’s simplest form and allowing us the spectators to create the horrors in our own heads. The Collective 3hund, of German artists Tarek Mawad and Friedrich van Schoor, embark on a journey in the nature - their favorite place - to immerse, record, and literally project. Projections in the Forest is a project inspired by images of nature. Bioluminescence is the production and emission of light by living organisms, occurring widely in marine vertebrates and invertebrates, and the famous terrestrial fireflies. Influenced by the ability of nature to create beautiful colored light, the collective had one objective - To create their installations practically, not added in post production. To achieve that, they used of projection mapping, creating shapes that would fit the organisms of the forest and projecting them into frogs, insects, fungi and trees. The result is this 4 minute piece, which also comes with a Behind the Scenes, showing how the artists achieved the result. This extremely simple piece about a man observing and talking about rain and the lack of it in the desert rapidly grabbed our attention by its uniquely delicate form of treating “simplicity”. This short doc reminded us all that there is something worth telling and showing even in the smallest occasions and in the simplest forms. It is through videos like these that we learned that simplicity is the peak of beauty. Jonathan Shaw, the character of our documentary Scab Vendor, is not only a renowned tattooist and author, he also gathered through his years in the scab trade around the world, one of the largest existing collections of vintage tattoo flash - a fine scrutiny of the young days of electric tattooing. 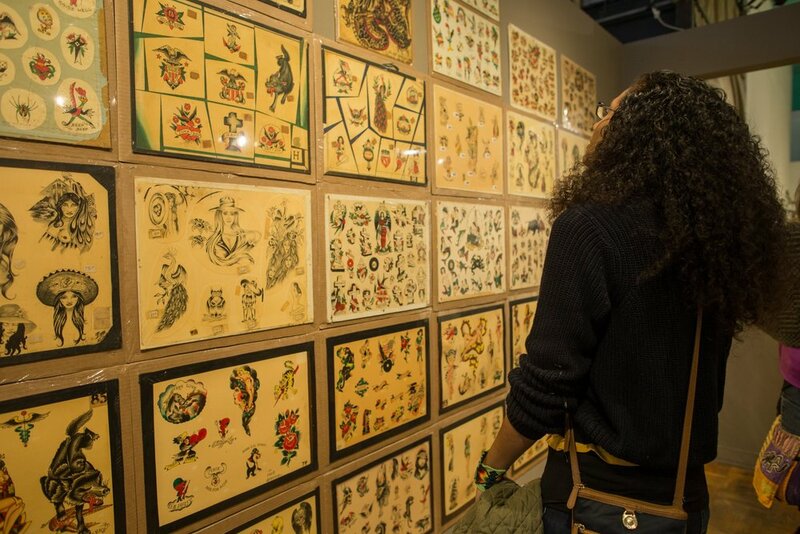 His book, 100 Years of Traditional Tattoos from the Collection of Jonathan Shaw, was released in April of 2016 and received a gallery exhibition at La Luz de Jesus Gallery in Los Angeles, where Jonathan displayed the original pieces on the gallery’s tall walls, the same way they were once exposed in their original tattoo studios. Jonathan also brought the exhibit to Oliver Peck’s festival The Elm Street Music and Tattoo Festival. Check out his interview. Despite it’s incredibly “moving” story and exemplary cinematic techniques, this video touched us deeply because it reflected on the importance we have in our community and how someone like Chris Fonseca was able to use his weakness into his trademark. The visuals in this documentary are stunning but it was the collage of different portraits that made this video the powerful mosaic it is and that captivated and inspired us. Each narrative blends wonderfully in this piece provoking different emotions and forcing us to make connections. In this short doc we explore the world of beauty in Arizona by two tomboys and this unique perspective of a subculture really hit our soft spot. We love stories that are told through different points of views that push us to examine what we know.